Solomon Kane, from the title alone, evokes the same mental image as “Alan Quatermain” or “Abraham Van Helsing” – either the movie will be about a swashbuckling hero or a sage protagonist with a wealth of knowledge used to help others. 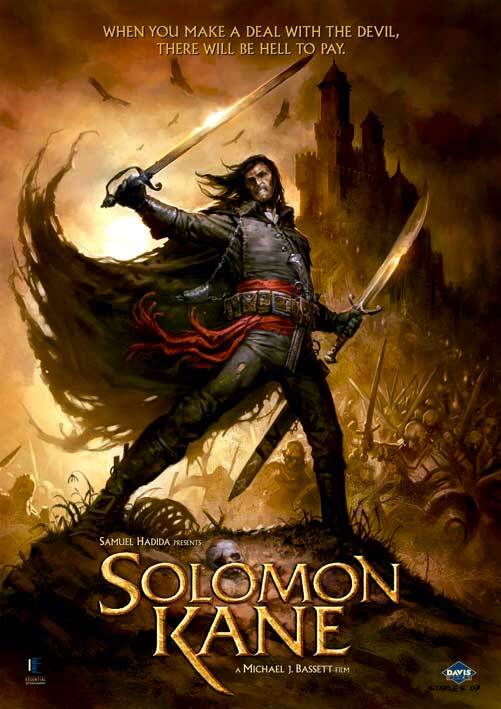 But Solomon Kane is neither of these fictional characters. Based on the character created by pulp writer Robert E. Howard, Solomon Kane is a wandering puritan who lived in the 17th century and whose goal is to vanquish evil wherever he encounters it. The character appeared in many stories in Weird Tales, the seminal title that brought many high quality pulp horror stories. I am not thoroughly familiar with Solomon Kane as a character so I’ll base this review solely on what I have seen in the movie and based on what I have just seen, Solomon Kane is a character that should really be given as much focus as the other comic book characters enjoying the adoration of the public. Solomon Kane revisits the same familiar tropes of faith and repentance but given a deliberate Hollywood polish of expansive cinematography and special effects. Michael J. Bassett, who both wrote and directed the movie, tried to do his best to cram as much of Solomon Kane’s origins in order to give the audience a heftier idea of why he seeks redemption. As “origin” movies go, Bassett also had to contend with trying to cram in as much background story as he could without eating up too much of his available screen time. It’s a worthwhile effort and I feel that even though he has not fully achieved his goal, it was still a passable effort that gave us a good glimpse of Solomon Kane before he repented and began his quest for the deliverance of his soul. Luckily, Bassett had a very capable actor in James Purefoy who injected just enough pathos in his performance that by the middle of the movie, the audience really roots for him. It is quite easy to ham it up in a movie like this but Purefoy managed to evade this easy trap. His Kane is fractured, conflicted and tortured but there is a nobility that shines through and a goodness that emerges naturally in his performance. Speaking of actors, I was quite happy to see the great Pete Postlethwaite as the well-meaning William Crowthorn. Actors like him always give any movie a worthwhile sheen and as always he delivers here. I feel that Jason Flemyng is thoroughly underused as the villain Malachai. His screen time is just not enough. The cinematography was a bit hit and miss. I don’t know if it was the copy that I was viewing but there were some scenes that were a bit too poorly lighted. But it’s undeniable that Bassett has a great eye. There were some gorgeous scenes that would put to shame most of the hacks in Hollywood — which makes me wonder why Bassett is not being given more high profile projects. Solomon Kane is loads better than the very poorly made Van Helsing. To compare him to Stephen Sommers is an insult to Bassett. I am also a bit underwhelmed by the movie’s ending. You get this feeling of wanting more but from the looks of it, it seems that the people behind the movie are hoping to make a franchise out of it. Hopefully, the movie has performed well enough to actually merit a sequel. All in all, Solomon Kane is one of those action/fantasy movies that are not being noticed because it doesn’t have the pull of an A-list actor. But I think the beauty of this movie is precisely the fact that it is not totally consumed by Hollywood’s touch. Fantasy/action fans would be well advised to check this movie out.